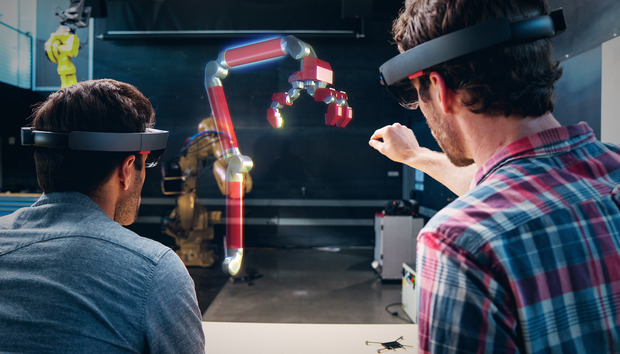 Microsoft’s HoloLens isn’t ready for prime time yet, but an interesting leak is giving outsiders a look at the augmented reality platform’s Start menu and an unannounced Bluetooth peripheral. The leak comes courtesy of a new Microsoft program called Actiongram that appears to be a platform for creating mixed reality videos. In other words, videos that add augmented reality elements like a cartoon character or a digital rendering to real world video capture. Twitter user Walking Cat (@h0x0d), who has a knack for poking around Microsoft sites and uncovering interesting documents and information, first leaked the information. Walking Cat’s previous efforts got us an early looks at Office 365 apps and Edge extensions. This time around, Walking Cat was able to grab some user documents and videos purportedly from the Actiongram site—dubbed Project Burbank—that show the Start menu in action and show a Bluetooth accessory for navigating the HoloLens interface. The story behind the story: If you’ve been following along with the Windows 10 story you already know that everything Microsoft comes up with these days is based on the new operating system. That includes the software running PCs, tablets, smartphones, the Xbox One, and, yes, even HoloLens. Just like those other products, HoloLens has its own version of the Start menu. What we’re seeing here is still in early stages, however, and is unlikely to be the finished product. The Start menu, dubbed the “Shell,” in HoloLens. In an Actiongram instructional video, the HoloLens Start menu is called the “Shell” and appears pretty basic. It features icons at the top for connectivity, time, battery level, and volume. Below that are a set of Live Tiles including Microsoft Edge, Photos, Settings, Windows Feedback, Windows Store, and another two that aren’t particularly legible. There’s also a Cortana logo above the Live Tiles, and that plus icon to the right of the Live Tiles takes you to the “All apps” screen similar to the Start screen from Windows 8 and Windows on mobile. Finally, below the Live Tiles are links to activate the camera in photo or video mode. Is this Bluetooth peripheral headed to stores with the HoloLens? To interact with the Live Tiles you “click” on them in HoloLens with an air tap, which is literally reaching your hand out in space and tapping. It appears Microsoft is coming up with an alternative method for navigation via a Bluetooth peripheral dubbed the Bluetooth Clicker. The handheld device has an elastic finger loop and a “thumb dish” at the top for clicking on items similar to a mouse—at least we presume that’s how it’s used. Microsoft has not yet announced the Bluetooth Clicker. It’s unknown whether the peripheral is something specially developed for Actiongram beta users or if it will be sold as an accessory for the HoloLens. We may know a little bit more about all this very soon, as one leaked document says Microsoft will announce Actiongram on February 29. Stay tuned. Can drones save Jamaica's fishing industry?